Accurate depth sensors for surveying and underwater operations, for stand alone use or combined with GPS positioning system. 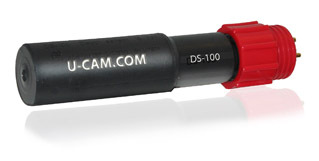 The DS- series sensors are ideal to use together with Inspecam cameras and Control Box GA for indication of the depth / pressure on the screen. Measuring of the dissolved oxygen on the display, as overlay text on the image. Can be used with Inspecam PT/HD/DW/Diver series cameras. Optical sensors have provided a much more stable measurement, but many types on the market are still slow to respond and require regular calibration due to degradation of the lumiphore material. dication of the depth / pressure on the screen.